Can you identify an area for improvement? The steps below will help take you from an initial idea or concern, all the way to running your improvement project. Use our Quality and Performance Dashboards to see the data on your service and across the Trust. To help you think about ways to get Service Users and Carers involved please find guidance here. After some of this initial thinking you should discuss your project idea with a QI Coach or Sponsor. At this point Coaches and Sponsors can help you decide if your project idea fits with local Directorate priorities and what components you will need in place for a successful project. 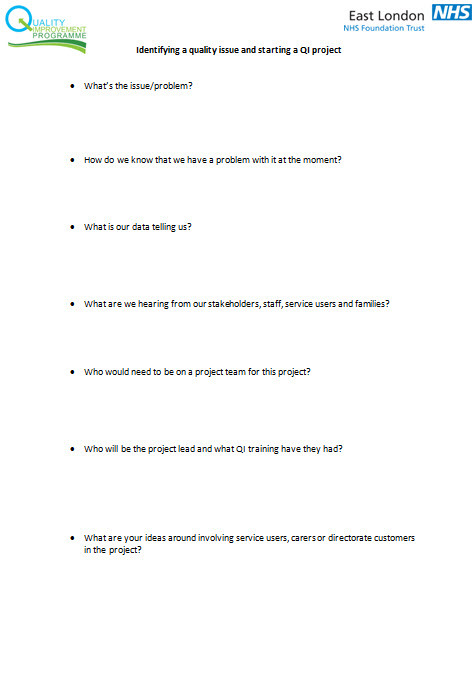 They will also help you prepare the project idea for your local QI Forum where QI project approval is given. QI Forums happen every month in all Trust Directorates, they are an opportunity for Project Leads, Coaches, Sponsors, Clinical and Service Directors and Service Users and Carers to come together and support local QI work and decide on priorities for improvement in the Directorate. Once your QI Project has been given the go ahead at your Directorate’s QI Forum you need to finalise everthing with your project team. We recommend that a QI project team should consist of 5-8 people from different disciplines, with different levels of experience, who are affected by the problem and can commit to meet regularly. You should include someone in the team who can make things happen, like a Ward Manager, Team Leader or Consultant. As you finalise your project idea with the team you should link up with the QI Coach allocated to your project at the Directorate QI Forum. 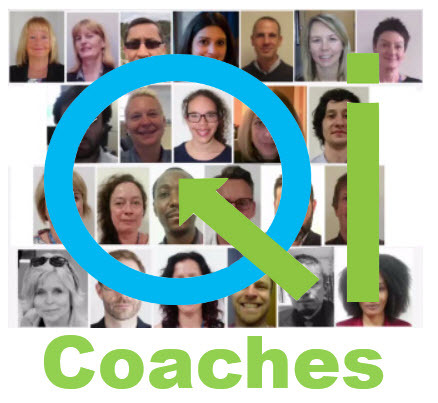 QI Coaches support teams to develop ideas and strategy, establish the project Aim Statement, introduce the team to useful QI tools, and advise on on how to complete project documentation. In the early stages of your project these electronic documents will be a project charter and driver diagram on QI Life. In later stages of the project they will help you with other aspects of QI methodology such as PDSA (Plan Do Study Act) cycles and using data over time. Use the Model for Improvement, our project charter and driver diagram templates to help you and the team think through your project and when you’re ready please register the new project to QI Life. Step 4 – Submit your project on QI Life and get going! After you have fully planned the project out with your project team and coach then you can finalise your project charter and add your driver diagram on QI Life. Alongside your driver diagram you can also add change ideas for the projects, measures and perhaps plan our your first PDSA cycle for testing. To learn how to use the QI Life platform please visit this page and watch some of our instructional videos below. Once you have completed these steps your project you are all set! Use QI Life throughout the project lifecycle and learn about improvement projects happening across the Trust and beyond.